WE ARE PLEASED TO REPORT THAT THIS PROJECT IS FULLY FUNDED! Last year, we came to you with an urgent request to help one of our partners in Peru. 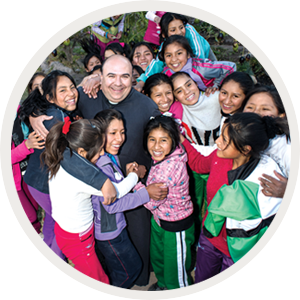 Father Adrian Codevilla — a wonderful servant of God — had dedicated his life to providing better educational opportunities for poor children by establishing low-cost boarding homes in the town of Cotahuasi so poor children could attend classes at the better schools there. It was an inspired solution, but the buildings eventually aged, became dilapidated and needed to be replaced. That’s when Fr. Adrian came to us with his desperate plea – asking us to build a new boarding home for the many impoverished boys and girls who wanted to attend school in Cotahuasi. We took on the project because we knew it would be life-transforming. It would ensure remote villages would be able to send their children to receive a solid education for generations to come. We are pleased to report that the new facility has been completed and ready for move-in! It has enough room to accommodate 70 boys and 70 girls — paving the way for twice as many poor children to receive an education. More children will now have access to books, desks, comfortable beds and tutoring — things that are not usually available at their own homes. If you were one of the many generous benefactors who made this worthy project possible, we thank you with all of our hearts. If you would like more information on the project, please read the report below.